No, it's not wise to run with eyes wide shut and mouth wide open! 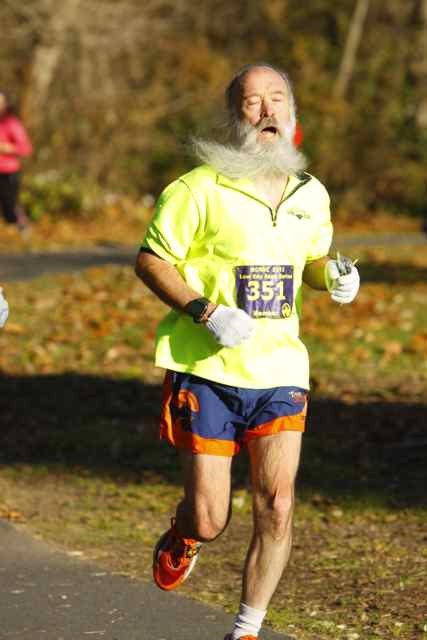 Image by Dan Reichmann is from the final stretch of the MCRRC "Candy Cane 5k", a fun run with good friends. Garmin GPS suggests the course was short, closer to 3.0 miles than 3.1, as does gun time of 21:50. The GPS estimates average pace of ~7.4 min/mi (with approx. splits: 7.5 + 7.5 + 7.2 min). Before the event I warm up by jogging from home; afterwards I stay to cheer runners coming in for the final 100 yards.